I recorded my first CD in 2010 with this group. The CD consists of sonatas by Pietro Castrucci (1679-1752) and Francesco Geminiani (1687-1762). The recording is based on a Walsh print called “Six sonatas or Solos contriv’d & fitted for a flute and a bass, collected out of the last new Solos compos’d by Mr. Geminiani & Castrucci…”, London, J. Walsh (1718-1725). The print contains 4 sonatas by Mr. Castrucci (sonata 5, 6, 10 and 11 from his 12 violin sonatas op.1) and 2 by Mr. Geminiani (sonata 7 and 10 from his 12 violin sonatas op.1). The original copy is to be found at The Rowe Music Library at Kings College, Cambridge. Furthermore I have taken two sonatas from the op. 1 violin sonatas by Pietro Castrucci (no. 2 and 3) and adapted them for recorder. I have kept them in the original key unlike the Walsh adaptation that has fitted all the sonatas for an alto recorder. By using a soprano (sonata no. 3 op.1) and a voice flute (sonata no. 2) I can play in the original key. The sonatas are lovely as well as challenging to play. They have followed me for quite some time now and I’m glad to be able to present the first full recording of this collection. Recorded and produced by Viggo Mangor. Recorded at Egedal Church, Kokkedal, Denmark in June 2010. Bressan altos (track 1-16, 21-25 and 30-33) and Voice flute (track 17-20) by Morgan/Ronimus. Terton Soprano (track 26-29) by Von Huene Workshop. 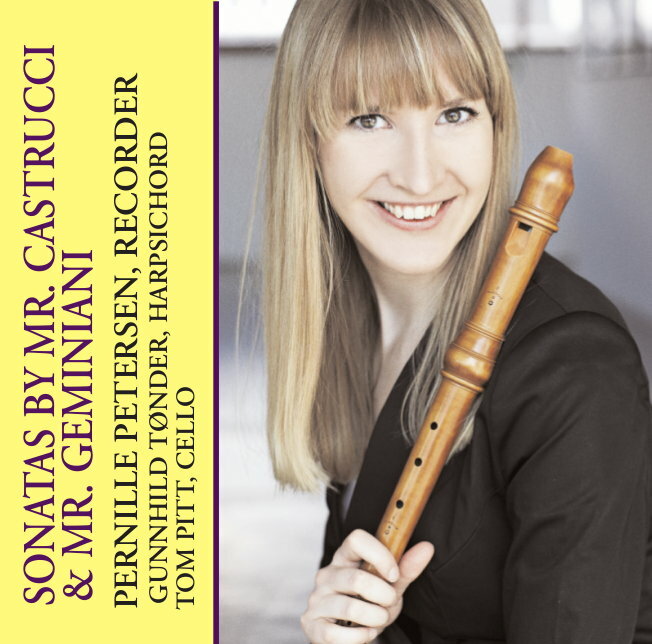 “This new CD is a recording based on a printed collection of flute and basso continuo sonatas by Francesco Geminiani and Pietro Castrucci printed by J. Walsh (1718-1725) in London and adapted from the violin sonatas. Both Geminiani (1687-1762) and Castrucci (1679-1752) were virtuostic Italian violinists who worked with Handel as freelance musicians for the British aristocracy and London houses, as well as elsewhere in Northern Europe. 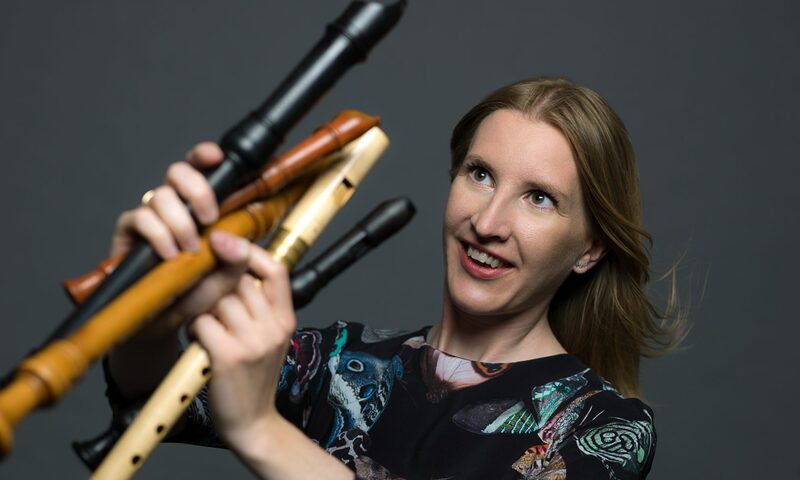 The cosmopolitan, virtuostic vitality of these works are reflected in the performances of the Danish recorderist Pernille Petersen (winner of the Moeck/SRP Solo Recorder Competition in 2009), the harpsichordist Gunnhild Tønder and English baroque cellist Tom Pitt. Throughout this CD the ensemble displays great precision and teamwork. Most effective are two sonatas by Castrucci taken from the op. 1 violin sonatas (no. 2 and 3) and adapted for the recorder. Unlike the violin sonatas adapted by Walsh to fit on a treble recorder, this ensemble has kept the original key by using a voice flute (Sonata no. 2) and descant (Sonata no. 3 op. 1). Castrucci’s Sonata no. 2 in E minor is certainly very suitable on the voice flute. The opening Adagio is very powerful, sonorous and melancholic. Petersen certainly communicates raw emotion in this first movement that gains momentum and tension in the second movement, Allemanda. Here the continuo team help propel the recorder to a dramatic pause at the end of the movement and a bizarre Adagio cadenza with a stately Aria Francese to conclude this breathtaking sonata. 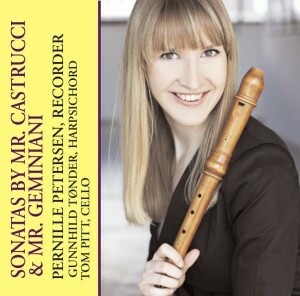 Castrucci’s Sonata no.3 in G Minor, played by Petersen on the descant recorder, begins with raw emotional harmonic tension. In this Adagio/Andante movement the tempo isolates nervously between rich and beautifully sustained suspensions and wild trills to energetic arpeggiated passages by Petersen and her continuo team that are hypnotic to listen to. In the second movement, Allegro Giu, the breathtakingly virtuosic recorder part is driven by the exiting and tightly rhythmical teamwork of the harpsichord and cello. Again this is followed by a quirky and frantically exhilarating dance Giga Allegro. Here Petersen, Tønder and Pitt display the wonderful talent and virtuosity of fantastic musicians who work amazingly well as a team. Hopefully this is the first of many recordings by this brilliantly engaging ensemble.